Associated Content offers both up-front payments (from $3-$50)� as well as payments per page view (currently: $1.50 per 1000 views). Submitting content as ‘exclusive’ (meaning: you agree not to republish it elsewhere) can mean a higher up-front offer, but submitting ‘non-exclusive’ is safer if you are considering reusing the same material elsewhere. Getting paid by Associated Content is quick and easy: they have no minimum payout and use PayPal to submit earnings at least once a week. Also, they allow writers to write on virtually any subject, so long as that subject hasn’t been covered on the site already (though some subjects can be covered from various perspectives). So, in short: you can get paid to write articles that are targetted mostly for Associated Content, which pays the most and has a good community of writers associated with it. First, though, you can submit those articles to Triond and potentially get some extra per-page-view earnings. After submitting to those sites, you can add your articles to your blog or another site with ads or other sources of revenue. Celebrity Visits Allsux (Sort of) – Hi Eric! Anyone who uses MyBlogLog is used to seeing the face of its founder, Eric, pop up on their contacts list from the first day they sign up. 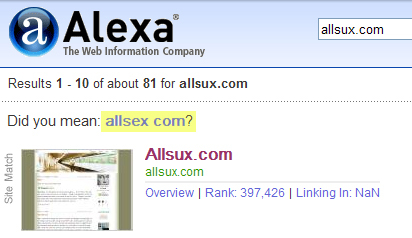 Still, I did a double-take when I saw that same face on AllSux today. I assume he’s checking Technorati for all things MyBlogLog-related, probably to see responses to the new features. Anyway, thanks for visiting, Eric! MyBlogLog has put me in contact with a number of my favorite bloggers – great site, service and social network. Keep up the good work! 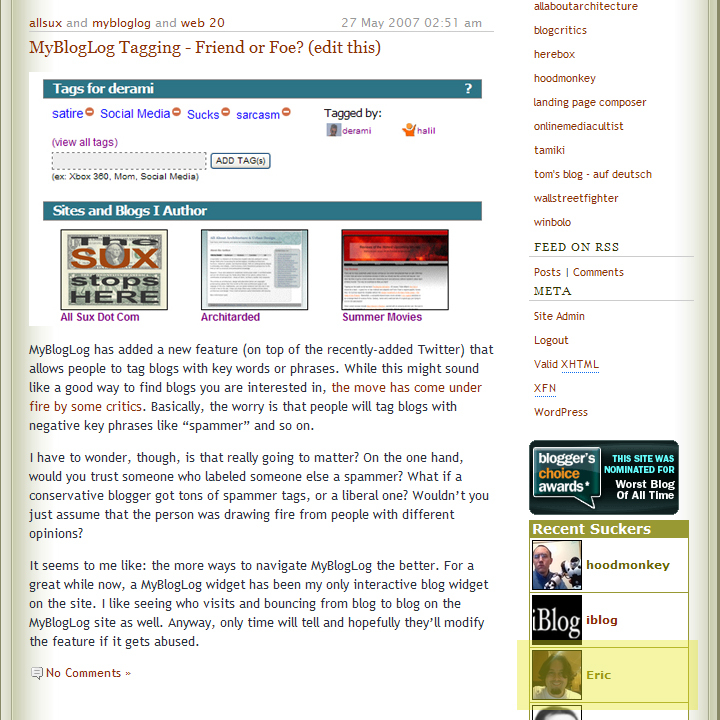 MyBlogLog Tagging – Friend or Foe? MyBlogLog has added a new feature (on top of the recently-added Twitter) that allows people to tag blogs with key words or phrases. While this might sound like a good way to find blogs you are interested in, the move has come under fire by some critics. Basically, the worry is that people will tag blogs with negative key phrases like “spammer” and so on. I have to wonder, though, is that really going to matter? On the one hand, would you trust someone who labeled someone else a spammer? What if a conservative blogger got tons of spammer tags, or a liberal one? Wouldn’t you just assume that the person was drawing fire from people with different opinions? It seems to me like: the more ways to navigate MyBlogLog the better. 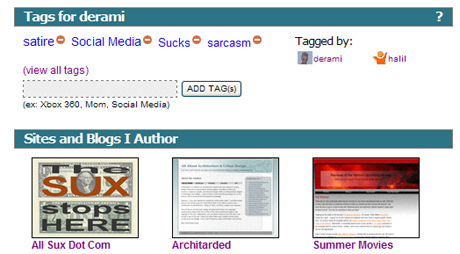 For a great while now, a MyBlogLog widget has been my only interactive blog widget on the site. I like seeing who visits and bouncing from blog to blog on the MyBlogLog site as well. Anyway, only time will tell and hopefully they’ll modify the feature if it gets abused. I’d like to take a moment of silence for the lambs. Thank you! 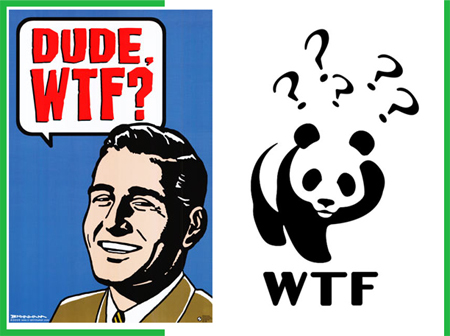 WTF is up with WTF? OMG WTF is GOING ON? 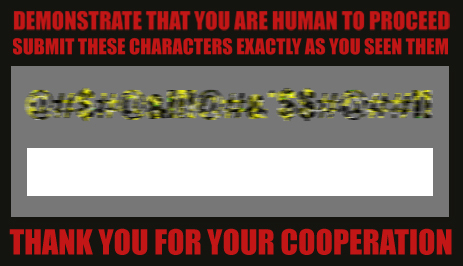 I have to admit, this is a pretty clever use of the Technorati WTF tool. Still, using WTFs only for self-promotion does seem a bit underhanded, at least so long as you like and respect Technorati as a real source of information! Right? But wait, I WTF-ed this article about WTFs! OMG WTF is going on! On that note, vote here to WTF this WTF … think of it is a meta-WTF to raise awareness about WTFs� like this. I’ll redirect all of this traffic to Technorati anyway – a great site people should use to look for better sites than this one!